This is the third in a series of five CD reissues from guitar legend Joe Diorio's classic Spitball Records recordings from the mid-70s. Originally released in 1976 on Spitball Records, Straight Ahead to the Light was recorded on May 23, 1976 at The First Unitarian Church in Miami, Florida and features Joe Diorio on guitar and Steve Bagby on percussion. Now available for the first time on CD including the original album cover artwork from the LP release. 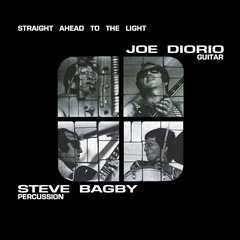 The album contains four original compositions by Joe Diorio and Steve Bagby which include “Straight Ahead to the Light", clocking in at over ten minutes long, “Gong", “India", another extended song that lasts for over ten minutes and “Bagbito" which features an extended percussion/drum solo by Steve Bagby.